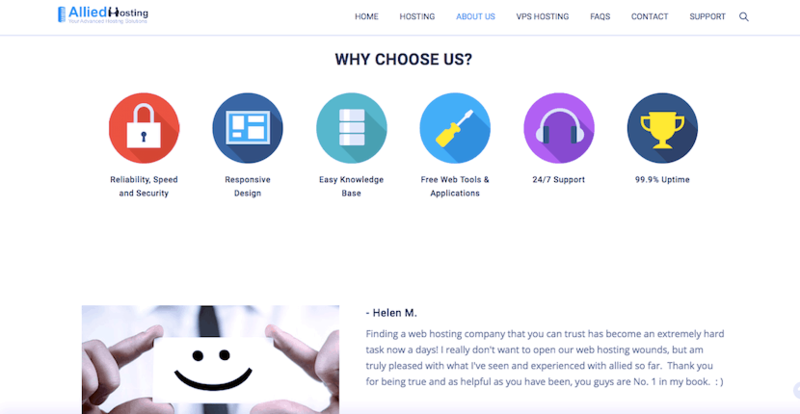 Allied Hosting Review 2019: Is Allied Hosting a Good Hosting? Allied Hosting, a U.S. based business, has tens of thousands of customers. As well as servers located in a Tier IV data center, they have 24/7 customer service and a 99.99% uptime commitment. Allied Hosting is a U.S. based business with servers located in a Tier IV data center. They’ve worked with almost 30,000 customers, hosted more than 45,000 domains, and won 90 awards for their work. Their website and support are provided in English only. Allied Hosting own their own servers, which they colocate in a Californian, U.S. Tier IV data center. While it’s always preferable to see hosts that own their own data centers, it’s very good news that they use a Tier IV location. This means that the center gets less than 26 minutes of downtime per year and has more than 96 hours of power outage protection. They commit to a 99.9% uptime guarantee, which is in their terms and conditions, however there is no compensation detailed in their terms in the event they have excessive downtime. In terms of value added features, they vary between the plans. The Personal package is quite limited, however, the two upper plans include a free app store and a one-click installer for hundreds of apps, while the highest package comes with a free domain. All plans enjoy instant setup, search engine optimization, periodic backups, and cPanel for the control panel. The more advanced features are a little sparse, however, all plans support CGI/Perl scripts, MySQL, and phpMyAdmin. Whilst the shared hosting plans are pretty comprehensive, they also offer a good selection of more enterprise level plans. When you’re ready to scale up your online business, they offer virtual private servers and reseller hosting, as well as dedicated servers and cloud hosting, which are coming soon. The monthly prices are good and come with a heavy discount compared with their “regular” price, which is also listed. Upon checking out it becomes apparent that the discounted price will be charged ongoing for all future payments as well, which is great, and not some gimmicky discount which is immediately increased on renewal. Domain registration is free in the highest plan, while optional SSL certificates are included in all plans. The plans can only be purchased in one month terms, which is nice and risk-free, and they also offer a thirty-day money-back guarantee. Regarding customer service, they offer 24/7/365 support. While they advertise a phone number and live chat on their website, they seem to prefer support requests to be submitted by ticket, and I could not get the live chat window to open. They also have a substantial knowledge base on the website. Allied Hosting is a full service hosting provider. If you’re serious about your uptime, they are a safe bet due to their use of U.S. Tier IV data centers. Wondering how Allied Hosting stacks up against other Web Hosting companies? Enter any other Web Hosting company and we will give you a side-by-side comparison.